Anyhow, recently, I was delighted to be able to actually meet Farley Cameron, a local artist. Farley has just launched her latest exhibition, Entwine (in conjunction with amazing ceramic artist Shannon Garson) at Art Nuvo, and I was there on opening night to see all the stunning work, and put a face to the name. It was so nice to meet Farley - she's not only an incredible artist, but also a lovely person, and very humble! What got you into art, and was it something you were always interested in? I have always been interested in the creative side of life. I grew up with a very creative, artistic family. My grandmother was an amazing dressmaker and I have very fond memories of spending hours with her when I was very young. I would play with the button-making machine in her sewing room while waiting for her to finish off some lady's dress. I thought it was magical that she could make a whole outfit for these glamorous women who came to the house, out of a flat piece of cloth. My mother was also an incredible talent with the needle. She taught me how to sew, about fabrics and how they should be cut according to the drape, and which fabrics were suitable for which purpose. From her I developed a sense of style and artistic appreciation. At school I did all the arts-related subjects and that’s what felt right for me. It was a natural progression to follow that track which lead me to study textile design. Can you please give us a brief rundown on your career, and the current exhibition? After leaving school I trained as a textile designer and worked in fabric/print design and fashion here on the Sunshine Coast for some years. Then came the time for the next phase of my life, motherhood - an experience that I think requires a huge amount of creativity, just expressed differently. Fortunate enough to be able to work part time (a husband can come in handy occasionally! ), I taught textiles at TAFE and worked in fashion boutiques, giving me time to spend with our daughter. But daughters grow up, and I had a yearning to get back to living creatively. I decided to upskill and headed back to Uni. That was a huge learning curve. After completing a graphic design degree I worked in that field for some years, both freelancing and at a local newspaper. This experience was invaluable for me as a creative person. I met and worked with some fabulous people who taught me a lot, however I eventually came to realise that the freedom of painting was calling. 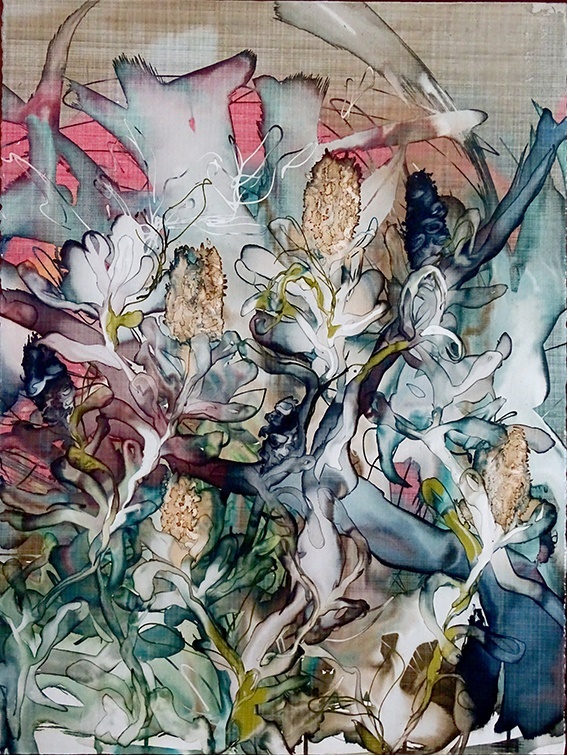 This exhibition, called ‘Entwine’, whilst having some textiles included, is predominantly works on paper, which is a progression from working with textiles. This requires a slightly different approach to how I construct the work in terms of composition and execution. The experience I gained as a designer helps inform the work. I have always painted nature. 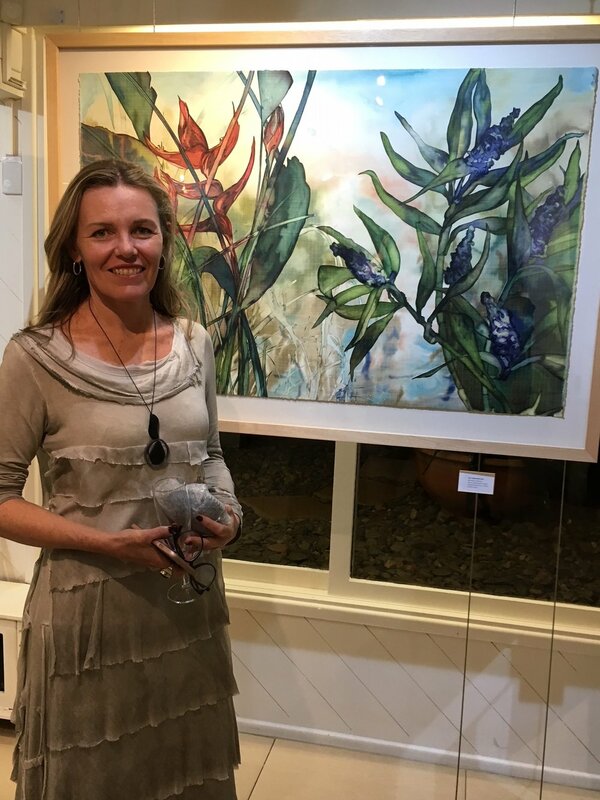 It’s a constant theme that runs through my work and ‘Entwine’ is a celebration of the natural world and environment that we are so lucky to have here on the Sunshine Coast. 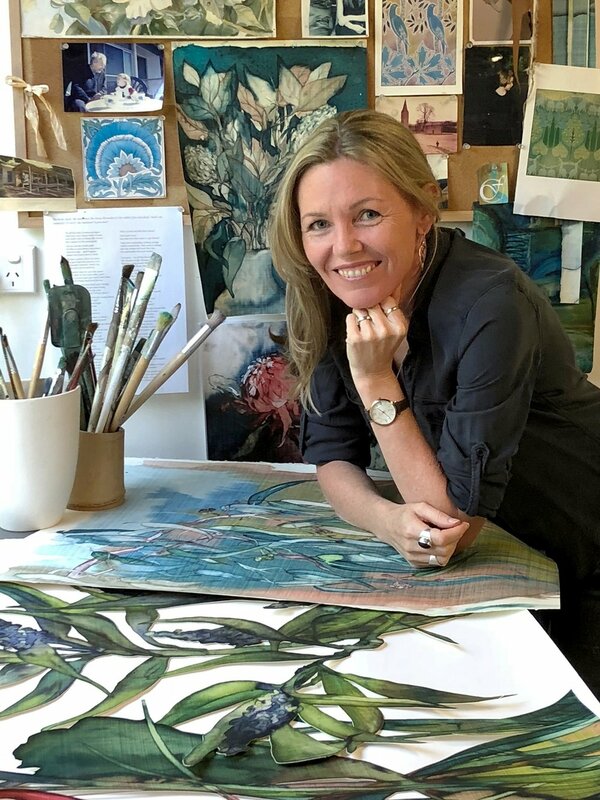 I love flora of all types and am especially excited by native flowers, so you will see a lot of banksia, waratahs and grevilleas as well as some others such as heliconias and gingers, in this exhibition. As my background is in textile design and later graphic design, both influence my current artwork and practice. As a designer you are trained to be aware of design principles such as line, texture, colour and form and use them to create interest in your work, so I am conscious of how I use these elements and principles within my painting. Painting, however, differs to designing a fabric repeat or a graphic element for a poster, as you need to approach the work as a whole composition. I think that I can see the influence of my designing history in my work today. I am also influenced by other artists and artworks, and these are varied and wide ranging. I love the work of old masters such as Vermeer with his incredible sense of light and colour, as well as more contemporary artists such as Margaret Preston and her woodblock prints. Getting out and into the galleries is always inspiring. It helps keep the momentum up. I find artists are generally very supportive of one another, so it helps to connect with them on a local level. I would say the biggest influence in my work is nature. There is everything you need to reference, all the elements I spoke of are right in front of you when you look closely. What tips can you share for other creatives? A couple of years ago I read Elizabeth Gilbert's book, 'Big Magic’ and something she wrote resonated with me. She said that you have to ‘do the work’. It’s a matter of actually physically getting down and doing the work, not just thinking about it. This really helps develop a discipline to your practice that enables you to focus on your creative goals. Even on those days when you’re not feeling it, just turn up. It doesn’t matter if what you paint, write, draw or whatever is not so great, it just matters that you do it, because that’s how you progress. That’s when you find your creative voice. Where do you create your work, and do you have any rituals in doing so? I’m a morning person, so after I walk the dog early, have breakfast and a cuppa, I head down to the ‘studio’. The ‘studio’ is actually our single garage and is busting at the seams with my art stuff. Luckily, I have a very understanding husband who doesn’t worry at all that the cars are relegated to outside. I generally work there until lunch or mid afternoon when I will then do some design work on the computer.